In creating strategies to face the effects of climate change, we also have the opportunity to address inequities that weigh heaviest on our most vulnerable communities. The factors that have made low-income communities and communities of color most vulnerable to climate change are the very same factors that we must address to adapt to threats without leaving anyone behind. Climate change is a threat multiplier, exacerbating existing vulnerabilities such as chronic health issues, lack of access to emergency resources, and more. 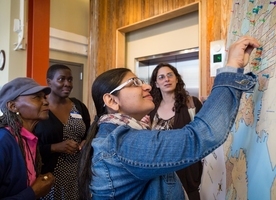 Georgetown Climate Center (GCC) recognized that practitioners and decision makers need a home for resources focused on making equitable adaption a priority instead of an afterthought—so with the help of partners they created the new Adaptation Equity Portal. GCC, in partnership with Urban Sustainability Directors Network (USDN), WE ACT for Environmental Justice, Emerald Cities Collaborative, the Gulf Coast Center for Law & Policy, Future Insight Consulting, and the National Association for the Advancement of Colored People, USDN, and representatives from Seattle, Cleveland, Washington, DC, Baltimore, added this database focused on equity to their existing Adaptation Clearinghouse. The larger Clearinghouse is “an online database and networking site that serves policymakers and others who are working to help communities adapt to climate change.” It holds thousands of resources, navigable by topic area, geography, tool type, and more. Users add to the usability of resources by rating and commenting on their effectiveness, accuracy, relevance, and other factors. As a nonpartisan convener, GCC brings together many people and perspectives and focuses on using lessons to provide guidance and resources. We spoke with GCC’s Institute Associate Melissa Deas about the creation of the Portal, and the vision for its future. Deas’s first step to creating a successful portal was to create and foster partnerships. The expertise of partners provided a necessary framing for equity in the context of the Adaptation Clearinghouse, guided by the “voice[s] of people of color and low-income people not typically engaged in planning processes.” Deas looked to people she and her team had worked with before, as well as others who had similar grants to work on equity in adaptation. Leaders of color and people who work closely with community groups were brought in as experts to help in the design of the Portal, modeling the way resilience building is known to be most effective—by engaging partners from the start. GCC hosted a two-day meeting with equity and adaptation experts, which provided the foundational elements of the portal, including building trust between agencies and community members, and creating partnerships beyond just in name. Spending time breaking down skepticism from communities regarding working with city officials and other entities and jurisdictions. Listening to reasons community based groups have been mistrustful of such entities, including about interactions when promises were made and not delivered upon. Following through. Deas notes it’s important to go “into meetings being clear about what you can do…[and] doing the follow through by connecting people with the right resources and contacts.” The follow through process includes getting feedback on what was done with the recommendations and comments gained from meetings, such as GCC’s contracting the advisory team to review the Portal before release. This review, importantly, was a paid ask for feedback, modeling how such feedback and time from experts should be paid, but rarely actually happens, particularly with individuals and organizations working in and for low income and communities of color. Looking forward, Deas hopes to extend GCC’s role as a convener and bring together folks on the ground facing challenges in equity and adaption work. Deas is also hoping to compile more analytical resources such as a social equity toolkit that would include examples and case studies of how people are funding equity work, what legal challenges they are facing, analysis on successes, and other important pieces that would encourage more successful equity work and adaption. Following up with the teams doing this work, says Deas, would be an important way to share lessons learned. While there is always desire for more resources highlighting those breaking ground on equitable adaptation projects, the Portal still has quite a spectrum of resources that highlight challenges and barriers associated with this work as well. Ultimately, says Deas, seeing “all of the different examples of people trying to answer these really hard questions… is grounding. Especially when things seem to not be happening fast enough” it’s a good reminder that things are, in fact, moving. We’re thrilled to see so many interdisciplinary, equity-focused resources gathered in one place. As we move forward in the field of climate adaptation, we continue to hold equity as a top priority. Don’t forget to bookmark the Adaptation Equity Portal, create a profile, and check back often, as resources are constantly being updated. Learn more about potential opportunities to partner with the Adaptation Clearinghouse. Check out the other work of the Georgetown Climate Center here and join the US Climate and Health Alliance to receive updates on the newest initiatives, events, and resources around climate change and health. On November 28 in Washington, D.C., the Alliance of Nurses for Healthy Environments (ANHE) and ecoAmerica’s Climate for Health program announced that five prominent nursing organizations have joined them as signatories of the new Nursing Collaborative on Climate Change and Health. The biennial California Adaptation Forum gathers the adaptation community to foster knowledge exchange, innovation, and mutual support to create resilient communities throughout the state. The Forum offers a series of engaging plenaries, sessions, networking opportunities, workshops, and tours to support our transition from adaptation awareness and planning to action. The Alliance is a national network of health and public health practitioners dedicated to addressing the threat of climate change as a human and health crisis.